And what exactly do you there? I don’t think it’s possible to describe in one sentence what you do there, so I’ll walk you through step by step instead. The first area you see after you’ve parked and walked up is what my kids call “the lake”. It’s a decent sized body of water surrounded by grass. Families lay out picnic blankets on the grass, and kids jump into the water to play on or around “the raft”. 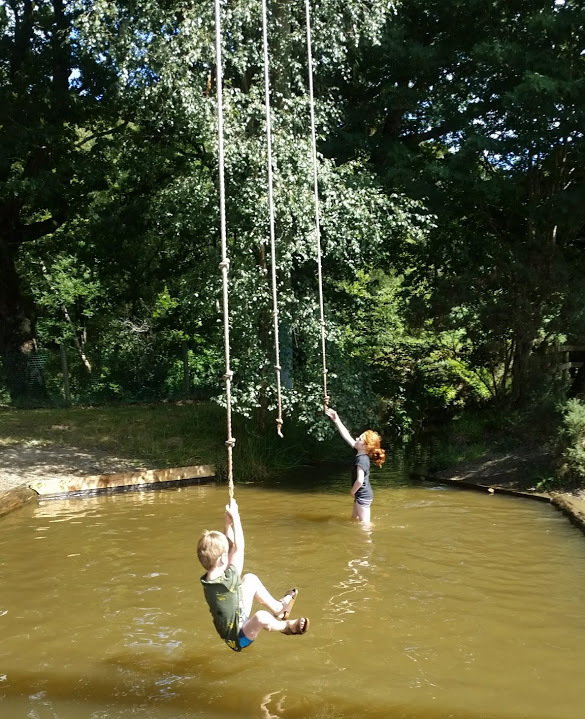 The lake also has a Tarzan swing – the kids hold on to a rope and swing over the water, then let go to jump in. It sounds really simple and it is – but they love it. 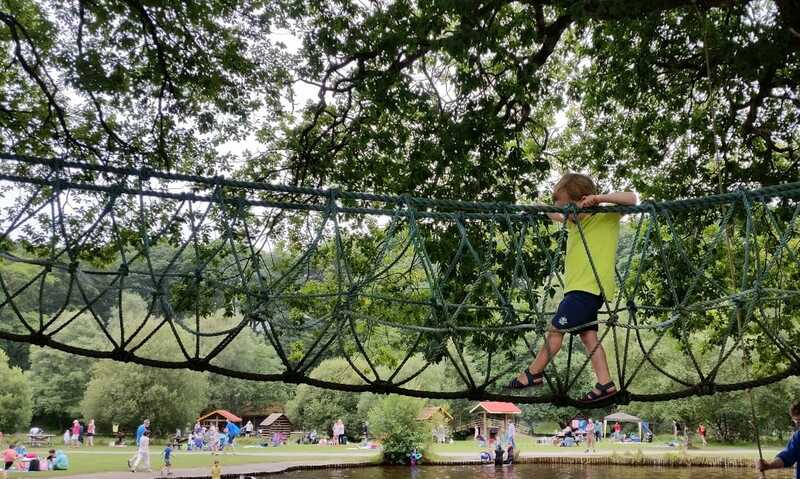 Beside that, there’s a ladder for climbing up into a treehouse and a rope bridge across to another treehouse – all enclosed, so even small kids can do it. Just a little to the right of that, there’s another rope-swing-across-water for smaller kids, and further along there’s one for bigger kids – it’s a little harder to avoid falling in, but it’s no more than knee deep. 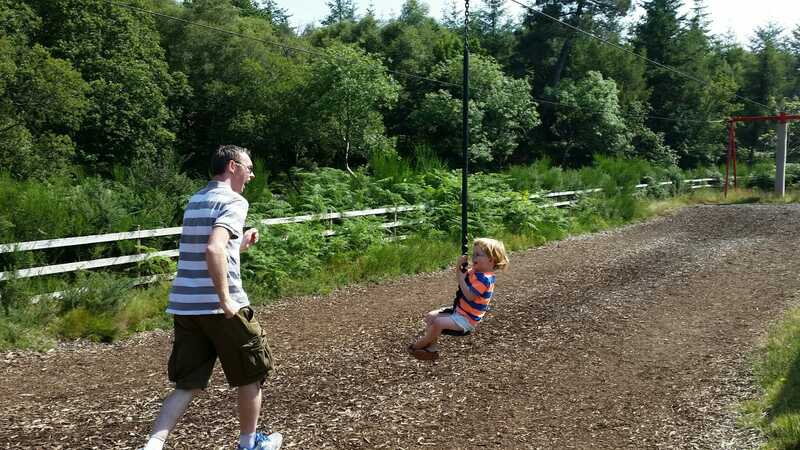 Further along again, there’s a big open area with slides, a zip-line, rope climbers, tunnel slides, more bridges and a sandpit – all made out of wood and rope and fitting in nicely with the countryside setting. 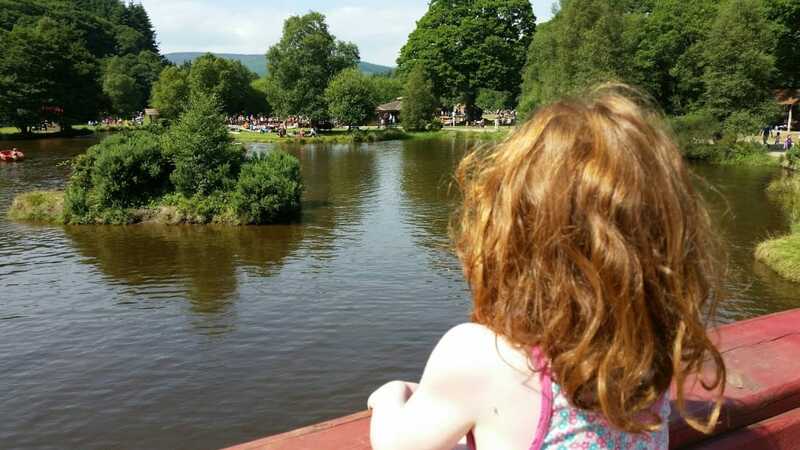 There’s a huge wooden pirate ship on which the kids can run around and watch the rowers on the water below, with a rope bridge for disembarking – no need to walk the plank. 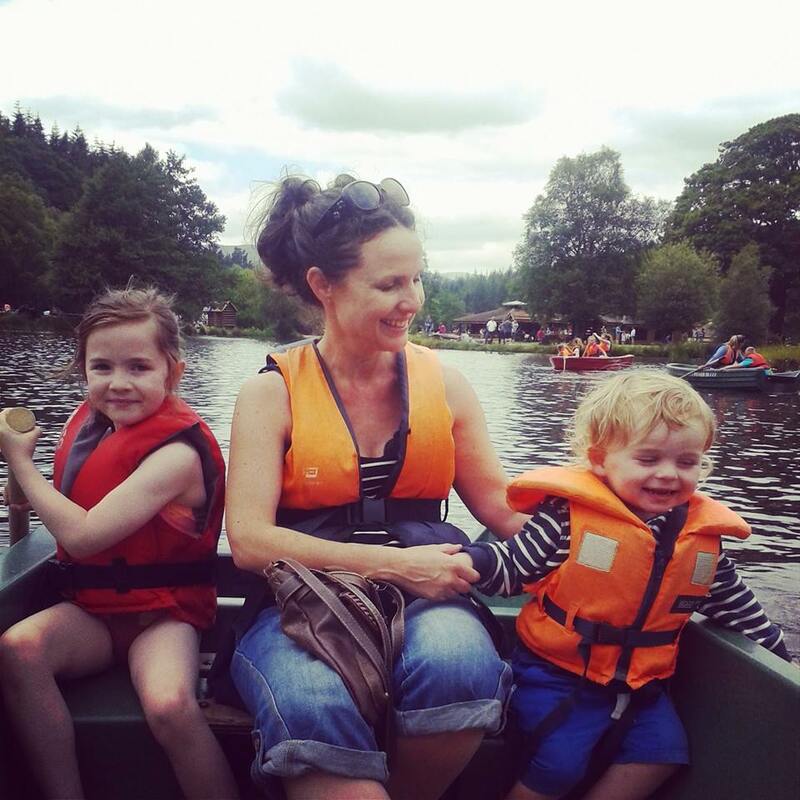 Hiring a rowing boat: We did that our first year and fourth year and we loved it (though first time was easier as the kids let us row – next time they wanted to join in and it led to more rowing than rowing, if you know what I mean). 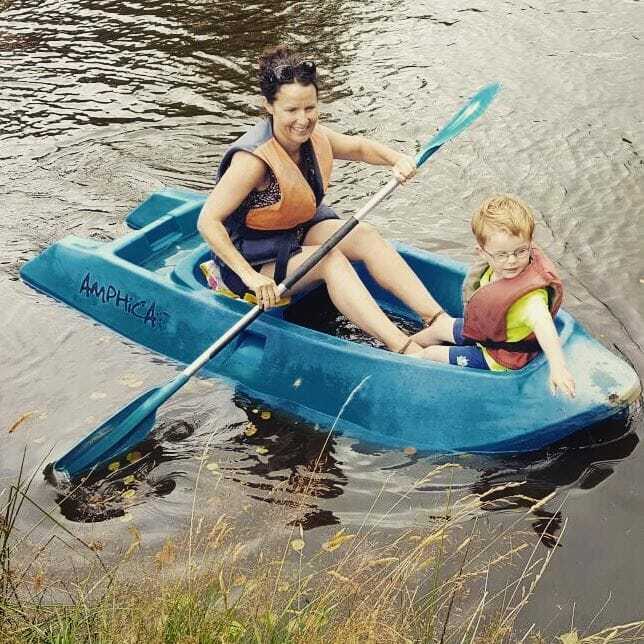 Amphicats: My kids call this kayaking, and we’ve done this for the last few years. My eldest two have been doing it on their own since they were about seven or eight, and I go with the youngest. 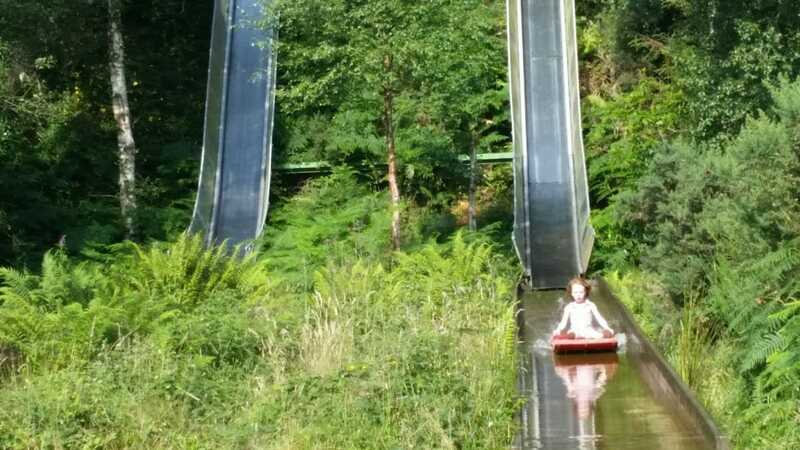 There’s really no way to avoid getting wet doing this, so leave it till you’re about to go home or happy to get changed, but it’s brilliant fun. Go-karting: This has a height restriction of 1.2 and my middle child was delighted to finally be tall enough to try it a couple of years ago after many failed attempts. (Small boy still waiting.) Both girls say it’s their favourite activity. There’s also mini-golf, but we’ve never tried it. Tickets for the paid-activities are mostly €2.00, except rowing which is €3.00 per boat. The best way to do Clara Lara is to bring a picnic. There is a restaurant in the park serving chips and snacks, but most people bring their own food. It’s an ideal setting for laying out a rug and breaking out the homemade sandwiches. Lots of people bring cool boxes, camping stoves and disposable barbecues too, and there are also some barbecues on site for customer use. In our house, the most important prerequisite is that we bring French Fancies. I know. But a tradition is a tradition. 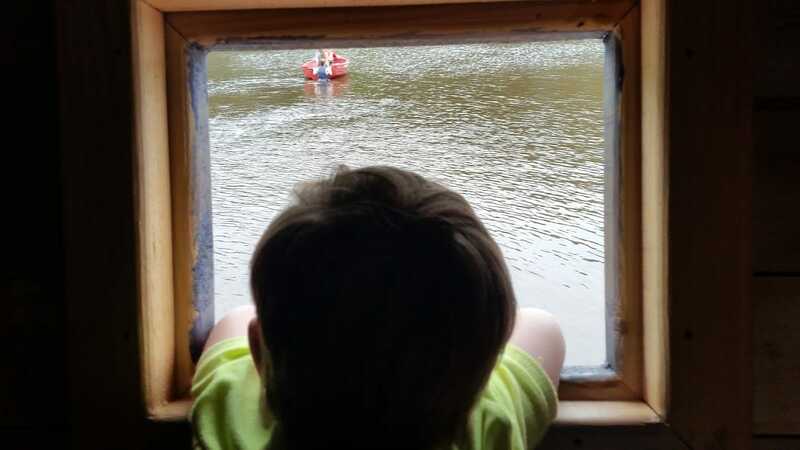 My kids wear swimsuits under shorts and t-shirts – you don’t have to wear a swimsuit but if your kids want to get into “the lake” with the raft, they might prefer to. Also falling off the Tarzan ropes is easier in swimwear. But it’s not a rule – shorts and t-shirts are fine too, and some people wear wetsuits. Shoes must be worn all the time, so either go in footwear that can survive getting wet, or old shoes that don’t matter. My kids always wear flip-flops, old sandals, or old runners. Crocs would work too, or cheap canvas shoes from Penneys. 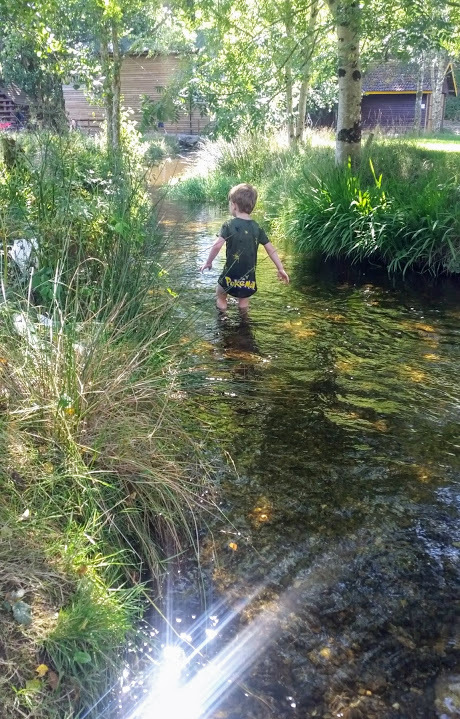 Bring towels for the kids – it can be chilly when they come out of the water, and bring a change of clothes for them. And don’t let them put on the dry clothes until they’re really done with everything – I have a child who changed, then got back on the Tarzan rope and fell in the water, and couldn’t understand why I didn’t have a third outfit with me. What a terrible mother. The site is a good size but not so big that it’s difficult to get your bearings or get from one end to the other quite quickly – particularly important if you have a small child who tends to wander. The staff are really, really good – they’re great with the kids when they’re manning the queues – kind but firm, and strict about safety. Also, they’re really good at making sure people take turns and don’t skip the queue – very important when you’re seven or eight years old. So back to the original question – what exactly is Clara Lara? It’s outdoor fun, it’s fresh air, it’s for kids, it wears them out, and according to my kids, it’s their favourite day-trip ever. We’ll be back. My kids love it too. The always say its there favourite day of the summer. God, i didn’t realise Clara Lara was still in the go! I was there with a summer camp in about 1988 and again the following year with my family. I must take the boys next summer. Yep, still going strong! Hope you had a safe trip back and yes, you should definitely bring the boys next summer! I really need to go there this year, now that my small girl is big enough. Do you reckon you need a warm day? I think it needs to be warm enough – mild anyway. Like 16 or 17 degrees. They do get wet and then they’re running around in their wet swimsuits/ shorts and t-shirts. So even overcast is grand, as long as it’s warm. I’d say it was packed today!